Day 4 in Barcelona was our first chance to spend time on the beach. We started the with a walk down to the beautiful Bogatell beach. A soft white sand beach located close to the city and only 5 minutes from our apartment. The beach was packed even on a weekday morning. Apparently due to the recession, many women in Spain can only afford half of the 2 piece bathing suit. Wha wha wee wha! Our first dip in the Mediterranean brought some warm but very salty water. 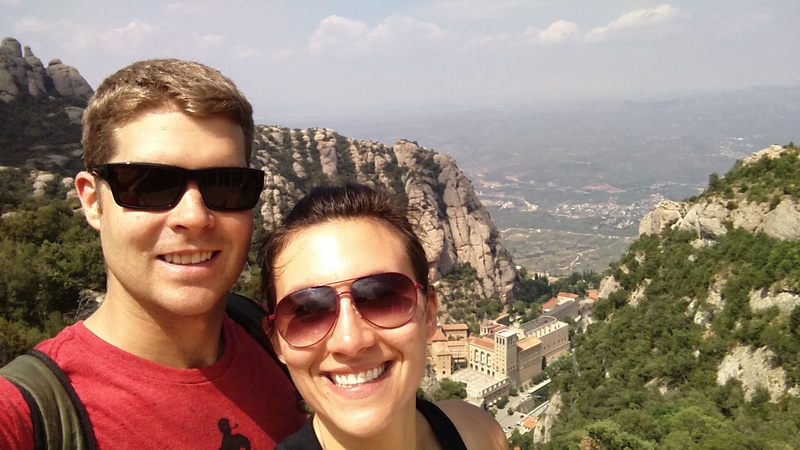 We enjoyed it a ton and headed to lunch near our place on the Poblenou Ramble. Set menu, 3 course lunch with an included bottle wine, sets you back about $25, that will work! The next day, we had a chance to do something that we didn’t initially plan on but ended up being the highlight of Barcelona. 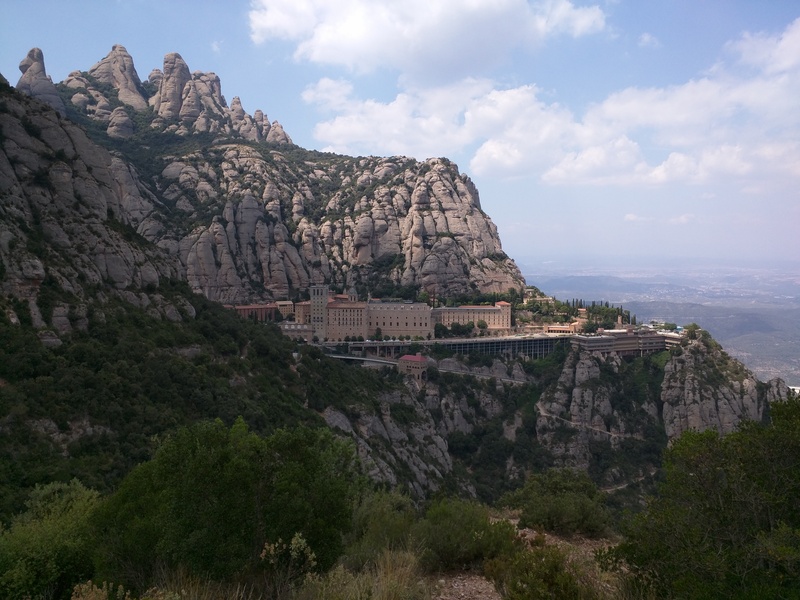 After reading up on the city, we read Monserrat monastery was not to be missed so we decided to take the hour train ride to the base of the Pyrenees mountains to check it out. To get to the monastery a couple thousand feet above, you can either take a funicular or a cable car. We elected to take the cable car from the train, which was awesome. It provides great views, if you can take the heights, suspended 250 feet up! Really makes you appreciate how hard it was to build the fortified masterpiece. The monastery itself is pretty sweet, built into the side of the mountain it’s the holiest place in Catalonia, Northern Spain. This is a view of the monastery from the adjacent mountain. The grounds were excellently cared for with detail and a reverence for the surrounding mountains built into all aspects of the design.Our favorite part was that from the monastery there are a bunch of hikes all over the surrounding mountains. Because we are balling on a budget, we could’ve easily spent €24 to ride the funicular to get this view. Nope, we’re walking, 3 hrs roundtrip! At the end of the day, we stopped by the monastery store to see what they offered. There was a bunch of local products made by the monks, and the surrounding villages. 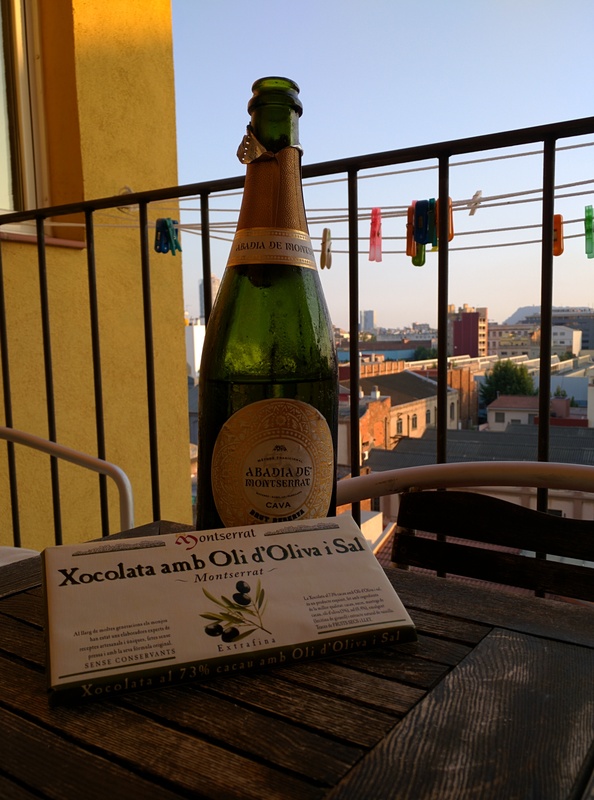 We ended up with this awesome bottle of Cava (Monk/Local Winery collaboration) and a monk made chocolate bar. A great way to end the day and our time in Barcalona. Tomorrow, were off to Valencia!